Many companies advertise a low price on water heater repairs or replacement but hit you with code upgrades and extras once they get in your door. With Valu-Rite Plumbing, there will be NO hidden costs or extras that wasn't listed up front. If we can't fix it; there will be NO CHARGE! If you've lost hot water to your home or office, Valu-Rite Plumbing can get you back up and running very quickly with very minimal costs. Water heater repairs such as the temperature and pressure relief valves, can cost you big money on your water bill!. These type repairs, as well as water heater shut-off valves, water heater burner assemblies, water heater thermal protection, thermastats, elements or water heater leaks does not have to mean you need a new water heater. We will visit your property free of charge to diognos the cost of repairing your water heater issue. 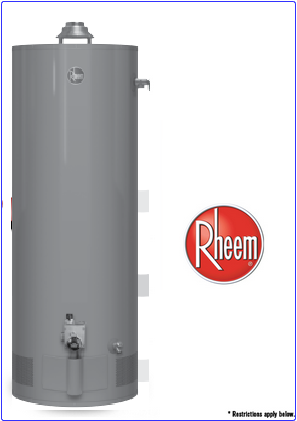 Valu-Rite Plumbing can repair any make or model water heater including Rheem, Ruud, A. O. Smith, State, American, Whirlpool or Kenmore gas or electric water heaters. We'll fix your existing water heater, or the visit IS FREE! Why Choose The Valu-Rite Water Heater repair Service? Many companies charge dispatch fees, trip fees, after hours fees, overtime fees on the final bill. With Valu-Rite Plumbing, you can avoid dispatch fees and high prices and rest assured, your water heater issue is being handled by professionals. Valu-Rite Plumbing provides a 1 Year warranty on all water heater repair services - something many other companies don't provide. If for any reason over the next year you should have another issue with your water heater repair, we will come out again at no cost to repair again; Gauranteed!